The filters in Thomas Duplex Super Safelights will deteriorate with age and should be examined periodically to ensure that the light is still properly filtered. The manufacturer recommends replacing the filters every 5 or 6 years. 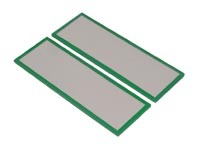 If you require replacement filters for the model DUX safelight (for X-ray films), this is the set of green edge filters that fit in the body of the safelight. For a complete set of filters for the DUX model, you will also require a set of FOD (red edge) filters to fit in the vanes. Note: Since medical and industrial X-ray materials vary over an exceptionally wide range of sensitivity and spectral response, preliminary tests should be made with each material being used. FOD ortho (red edge), FBD B&W (yellow edge), and FCD color (black edge) filter sets are also available - please see the separate listings.